Results: 1 to 10 of a total of 371 results. Nominal Shin Buddhist, looking for answers I am a more-positive, less-judgemental person than I used to be. I do struggle with being a westerner on the one hand, always wanting for more, and a nominal Buddhist on the other, reveling in the everyday suchness and equanimity. Call it a religion or a philosophy, I've found that it works for me. Does namaste805 belong in this group? always was attracted to there believes really dont have a religion but from the little bits i have heard about buddhist believes is that its calm open minded all in all just tyring to live a good life for yourself and the ones around you with good thoughts and actions. Does dil12 belong in this group? If I was forced to join an ism it would be Buddism I used to sit with Japanese Monks at a monastery. I also attended a Tibetan Buddhist art school. Does italamer1134 belong in this group? Does zubicon belong in this group? I like reading and music and also have an interest in languages (I speak French and Italian). 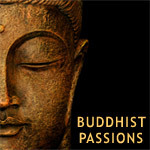 I am interested in Buddhism and similar ways of thinking. I have recently divorced and have 3 children who live mainly with me. I am not very good at describing myself. Ideally I would like to meet an attractive, thoughtful, easy-going and feminine woman. Does classicman1 belong in this group?